For thousands of years, spices were used to transform bland foods into culinary delights. Though modern world is aware of their antioxidant, anti-fungal, an anti-inflammatory and antimicrobial attributes, many of them have still not realized the use of spices in burning body fat. You can rely on some common spices and herbs to shed off those extra pounds from your body. Just make sure you stick to the use of organic herbs and spices. Cinnamon is supposed to be one of the most powerful fat burning spices. Make a habit to include it as little as 1/4 to 1/2 teaspoon a day in your meal and you could cut your triglycerides and total cholesterol levels by 12 to 30 percent. Also, its use can help stabilize your blood sugar levels. Regular use of cinnamon may help you prevent formation of blood clots. This spice is also recognized for its antibacterial and anti-inflammatory properties. It is also rich in antioxidants known as polyphenols. Add a bit of cinnamon to your coffee or tea, smoothies, or use this spice in curry dishes and stews. Also, you can sprinkle it over your yogurt, morning oatmeal, cottage cheese, baked goods and fruit dishes. Cayenne has got an amazing way of reducing your belly fat. Cayenne pepper is rich in capsaicin which is a phytochemical found to increase satiety. Thus the sense of fullness may help you to reduce overall food intake and keep a check on your increasing weight. Cayenne pepper is also well known for its cancer-protective, heart supportive, anti-inflammatory and pain-relieving effects. Add half teaspoon of cayenne pepper into your favorite stir-fries, ethnic-inspired dishes or stews to accelerate your weight-loss efforts. By eating phytochemicals-rich garlic regularly you may reduce your fat stores and body weight substantially. It is also found to reduce the effects of unhealthy diet on your blood and liver. In addition to being a wonderful antibacterial agent, garlic is known to have numerous other health benefits like blood pressure reduction, fighting inflammation, lowering the risk of heart disease and protection against osteoarthritis. You can eat a garlic clove with small amount of honey or alternatively just wrap it in a lettuce leaf or insert into a tomato slice. For maximum benefits, crush fresh garlic and let it sit for at least 10 minutes before cooking. This will release the enzymes that have been trapped in the garlic and help retain good amount of its beneficial compounds. A study done over animals has suggested that curcumin- rich turmeric’s antioxidant and anti-inflammatory effects may help reduce body weight. In addition to burning your fat, turmeric may also be used to treat arthritis, digestive problems, infections and some cancers. Inflammation reduction is also associated with the chemicals found in turmeric. Just a pinch of turmeric powder can add a warm, earthy aroma and lovely taste to meat dishes, seafood, vegetable curries and chutneys. Ever tasted the pungent-flavored black pepper? It can help you control your weight due to the presence of a component known as piperine that may interfere with the formation of new fat cell sand set off a metabolic reaction in your body. However, human verification is needed to confirm this. Not only does black pepper burn extra fats, it also improves your digestion. A pinch of black pepper can be used to make your curries even more flavorful. The small rounded seeds of mustard plants may boost your metabolism to a good amount as they are found to have a thermogenic effect on the body. This is how they can help you lose weight and improve your overall health. Mustard seeds are rich in compounds that may inhibit the growth of cancer cells. They can also be helpful in breaking your chest congestion. Keep your calorie intake down by adding mustard seeds in your favourite vinaigrette. Drizzling on your salads, sandwiches, cooked string beans, asparagus or broccoli would be another fantastic idea. Primarily used as a digestive herb in Indian medicines, ginger root can aid weight loss by boosting digestive juices, removing toxins and suppressing appetite. Ginger has the ability to fight inflammation, reduce pain and may work against migraines by blocking inflammatory substances known as prostaglandins. Instead of sweetening your oatmeal with sugar, try a big pinch of ginger which may be a calorie-free alternative for you. By working as a natural appetite suppressant, the extract obtained from ginseng berries may be effective against obesity. In addition to the weight gain control, ginseng is also found useful in controlling blood sugar levels by creating sugar-lowering effects. It can also be used as a tonic to boost energy levels. Drinking ginseng tea is a wonderful way to regulate metabolism. A new study done by scientists at Anglia Ruskin University found that decaffeinated version of the green tea when combined with exercise can aid in shedding your fat. This may be due to fat oxidation process taking place in your body. A compound found in green tea may be able to kill mouth cancer cells while leaving healthy cells undamaged. So its consumption is also effective in treating oral cancer. According to the University of Maryland Medical Center, you may drink 2 to 3 cups of green tea daily in order to receive sufficient amount of its health-favoring active ingredients. It will be very important to understand that there is no magical wand to reduce weight. Though appetite suppressants are effective, but they only work till the time you are taking them. If used for long-term it can lead to addiction and create more serious health complications for you. 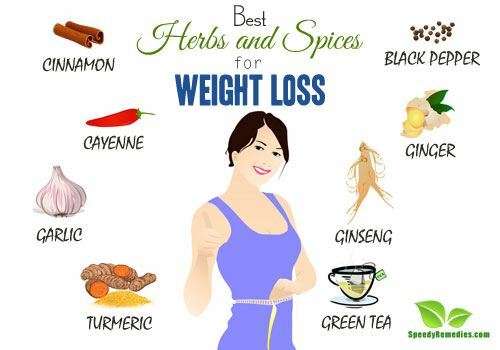 To sum up, to shed those extra calories, you should also adjust your eating habits along with the intake of these herbs and spices or else you may simply regain any lost weight. Also, don’t forget to tell your health care provider about the herbal remedies you are taking.